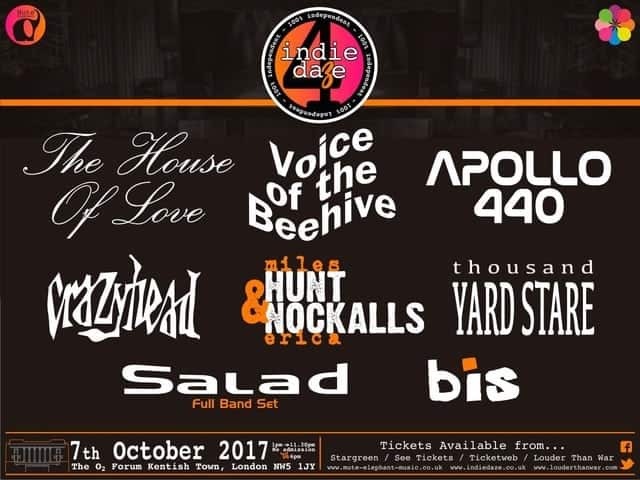 Indie Daze is returning for its fourth consecutive year at the Kentish Town Forum. The House Of Love will headline with their first London show in four years, returning to the site of their legendary ‘Doing It For The Kids’ show in 1988. Also back are Voice Of The Beehive with the first show from their original line-up in 25 years (including Woody on drums having a couple of days off from Madness) and Apollo 440 who break cover for their first UK show in over a decade. Filling out the rest of the line up is a rare London appearance by Crazyhead, Miles Hunt & Erica Nockalls and Thousand Yard Stare.